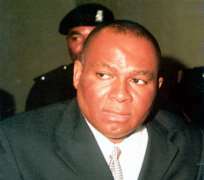 Operatives of the Economic and Financial Crimes Commission, EFCC, on Monday August 10, 2009 sealed up the premises of Cosmo FM radio station, Rainbownet Nigeria Ltd and other companies believed to be owned by former Enugu State governor, Senator Chimaroke Nnamani. The action followed a directive by the Executive Chairman of the anti-graft agency, Mrs. Farida Waziri who was acting on reports that some agents of the former governor had broken into the companies' premises to take physical possession of the seized assets. The properties were seized by the EFCC through a Lagos Federal High Court order in May 2007 following the indictment of Nnamani over alleged corruption and embezzlement of state funds to the tune of N5.3billion. A statement by the Commission on Monday denied media reports that it had returned the seized companies to the former governor. “Indeed, the companies were seized on the order of a Federal High Court, Lagos in May 2007 and a reversal order obtained by the management of the companies in Appeal Court, Enugu recently. Although the same court held that the Commission can exercise its powers over the companies, the EFCC has however filed for a stay of execution and an appeal against the unfavourable aspect of the judgment” the statement said. “While the issues were still being sorted out in court, reports had it that some agents of the owners of the companies broke in to take possession of the premises. The criminal aspect of that had since been reported to the police to investigate while after proper briefing, the EFCC chairman last week directed operatives to seal up the premises, an order that was effectively carried out on Monday after all necessary security arrangement had been put in place”, the statement added.